The Rías Baixas D.O. is located in Galicia, in the verdant Northwestern part of Spain, overlooking the Atlantic Ocean. Albariño is the finest grape variety in Rías Baixas and accounts for 90% of all the vineyards in the D.O. Mar de Frades is 100% Albariño from Val do Salnes, Rías Baixas’ best sub-appellation. A state-of-the-art winery was completed in 2006. Artisanally grown and made, only hand-picked and hand-sorted fruit is used. Mar de Frades is cold-fermented in temperature-controlled stainless steel tanks. Innovative thermographic labeling; the blue galleon appears on the label when the wine is properly chilled. 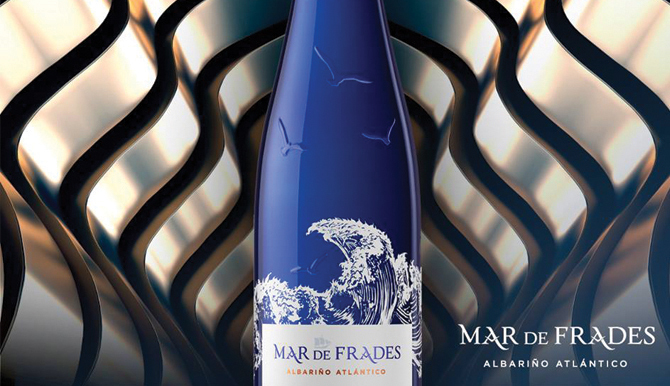 Mar de Frades is the finest expression of Albarino, the best selling Spanish white wine varietal.